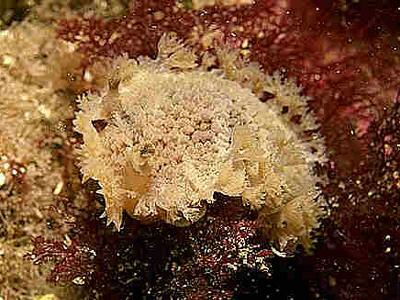 Description: Tritonia hombergi is the largest of the British nudibranchs, with a maximum recorded body length of 200mm. The colour varies from white to pinkish-brown. The mantle bears many soft, arborescent processes at its edge, that function as gills. The back is covered with rounded tubercles which exude an irritant compound. 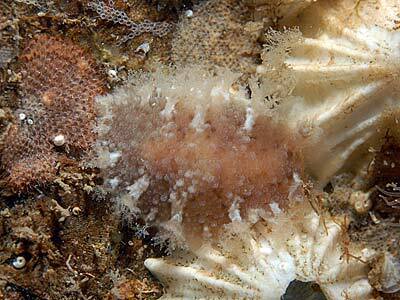 The rhinophores are branched at the tips and have basal sheaths, as in all Tritonia species. There are many small processes on the oral veil. Habitat: Tritonia hombergi is a sublittoral species in the British Isles where it has been found at depths down to 80m. As a juvenile it is well camouflaged on its prey, the soft coral Alcyonium digitatum, but larger individuals are darker in colour and hide in crevices or beneath overhangs. The spawn consists of an untidily wound white rope of eggs with a transparent membrane along one edge, attaching it to the substratum. Distribution: This species is frequent all around the British Isles. Many irregular sized gills arising from the mantle edge. Many processes fringing the oral veil. Rhinophores with sheaths and branched processes at the tips. Picton, B.E. & Morrow, C.C. (2016). Tritonia hombergii (Cuvier, 1803). [In] Encyclopedia of Marine Life of Britain and Ireland.